Despite poor agreement between testing techniques, the efficacy of ASIT does not correlate with a certain testing method or assay type.2 Our inability to discriminate between these allergen selection methods in terms of ASIT efficacy may reflect the paucity of prospective studies comparing ASIT based on different allergen selection techniques, or may indicate that they are indeed equivalent. If the techniques and methods that produce disparate test results are equivalent in terms of ASIT efficacy, this suggests that factors such as patient history, likely allergen exposure, and other parameters that may influence the antigens selected for ASIT (e.g. cross-reactivity) are as influential in determining the efficacy of an ASIT mixture as are allergy test findings. 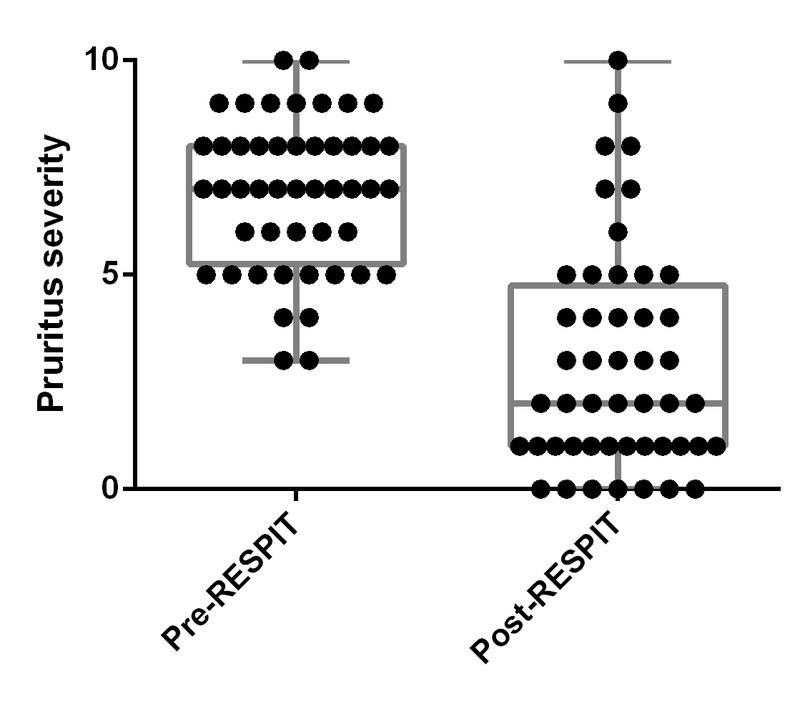 In this case, region-specific immunotherapy (RSIT) based on predicted allergen exposure may have efficacy similar to ASIT. This benefit could stem from the inclusion of some, if not all of the allergens to which a dog is sensitized, the influence of pan-allergens, or non-specific effects on the immune system. There are two unpublished studies examining the efficacy of RSIT. In a double-blinded study, Garfield found a 76% “good” to “excellent” response rate to a stock mixture of 32 allergens in 29 dogs, not significantly different from those that received ASIT based on IDT results.3 In contrast, using a mixture consisting of four alum-precipitated allergens (house dust, dog dander, human dander, and grass mix), Willemse found that the response rate in 15 dogs was inferior to that obtained with ASIT.4 I would like to report the results of a survey of veterinarians who prescribed commercially-available RSIT mixtures that were selected based on a dog’s geographic location and predicted exposure rather than individual allergy test results. All 160 veterinarians who had purchased the injectable form of RESPIT® (SkinVet Products, Lake Oswego, OR, USA) between March 2010 and September 2012 were contacted by mail in June 2013 and asked to review their patients’ records. Each aqueous allergen mixture contained 20 house dust mite and regional pollen antigens. Surveys were accepted up to a predetermined deadline of July 31. 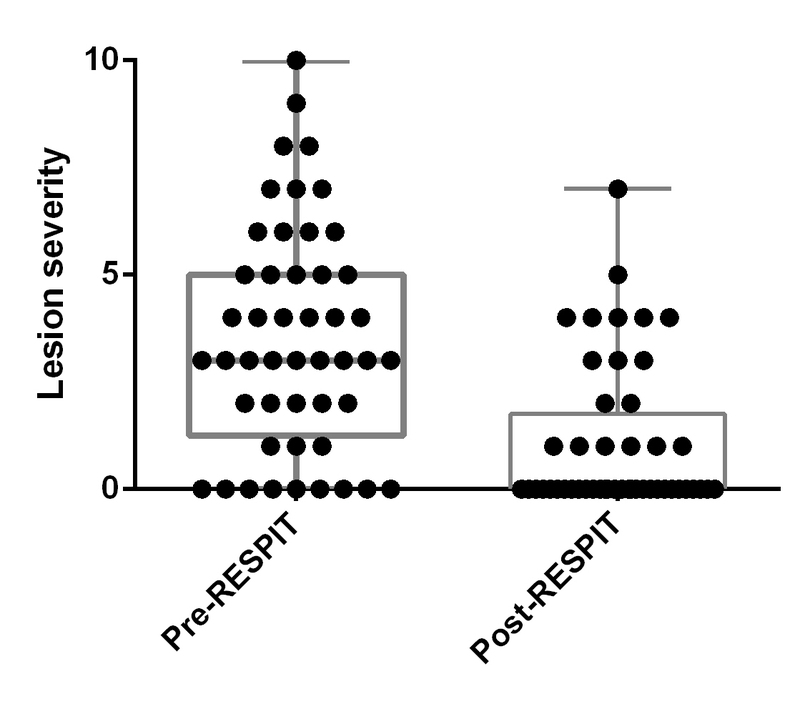 Veterinarians were asked to complete one survey per dog treated with RESPIT fulfilling defined inclusion criteria, estimating pruritus and lesion severity at Day 1 of RESPIT therapy and again at the time of the most recent follow-up examination. Veterinarians graded the overall effectiveness of RESPIT for each dog on a categorical scale (poor = 0-24% reduction in itching, no reduction in additional medications; moderate = 25-49% reduction in itching, some reduction in additional medications; good = 50-74% reduction in itching, some reduction in additional medications; excellent = 75-100% reduction in itching, receives no additional medications). Fifteen veterinarians completed surveys based on chart reviews of 50 dogs (24 males, 26 females, mean age of 6.7 years). Sixty-three percent of follow-up examinations took place during the months from April to September. No follow-up was available for 2 dogs. The majority of dogs had been treated for at least 12 months with RESPIT at the time of the follow-up examinations (median 382, range 27 – 920 days). The 15 veterinarians who completed the survey were located in seven states (California, Florida, Illinois, Nevada, Oregon, Tennessee, and Texas). The allergen mixtures were different for each of these states. The median pruritus severity and lesion severity were lower at the time of follow-up than on Day 1 (Figure 1). Figure 1. (a) Pruritus severity and (b) lesion severity (median, range, interquartile range) in 48 dogs with atopic dermatitis pre-treatment and post-treatment with region-specific immunotherapy (RESPIT). The median interval between the two retrospective evaluations was 382 days. Veterinarians assessed the overall efficacy as “good” or “excellent” in 69% of dogs evaluated beyond 90 days (29/42) and in 61% of all dogs treated (31/50). Adverse reactions (increased pruritus) were reported in 4/50 dogs resulting in the discontinuation of RESPIT in one dog. The retrospective nature of this survey, the low participation rate and the likelihood of self-selection bias are significant limitations that affect the generalizability of these findings. It is, however, interesting that the response to RESPIT reported by 15 veterinarians for these 50 dogs is similar to the response rates often reported for ASIT in retrospective studies and for RSIT in the randomized-controlled trial by Garfield. Prospective studies are required to verify these findings. 1. Plant JD, Neradilek MB, Polissar NL, et al. Reproducibility of allergen-specific IgE assays and ensuing immunotherapy recommendations from four laboratories. In: Abstracts of the 26th Annual Congress of the ECVD-ESVD, 19-21 September 2013, Valencia, Spain. Veterinary Dermatology 2013;24:391. 2. Miller WH, Griffin CE, Campbell KL, et al. Muller & Kirk’s Small Animal Dermatology. 7th ed. St. Louis: Elsevier/Saunders, 2013;380. 3. Garfield R. Injection immunotherapy in the treatment of canine atopic dermatitis: comparison of 3 hyposensitization protocols. 8th Annual Members Meeting of the American Academy of Veterinary Dermatology & the American College of Veterinary Dermatology 1992;7-8. 4. Anderson R, Sousa C. Workshop report 7. In vivo vs. in vitro testing for canine aotpy. In: Ihrke P, Mason I,White SD, eds. Advances in veterinary dermatology. New York: Pergamon Press, 1992;425-427. This entry was posted in Atopic Dermatitis, immunotherapy, RESPIT and tagged ASIT, atopic dermatits, canine, dermatology, dog, immunotherapy, regionally-specific immunotherapy, RESPIT, RESPIT efficacy, veterinary dermatology, veterinary medicine. Bookmark the permalink.